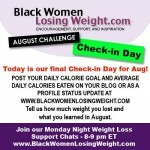 It’s time to check in for our August Challenge – The Calorie Deficit Challenge. I want to know how your last week went in terms of caloric intake. How much weight did you lose? What did you learn about the food you were eating.